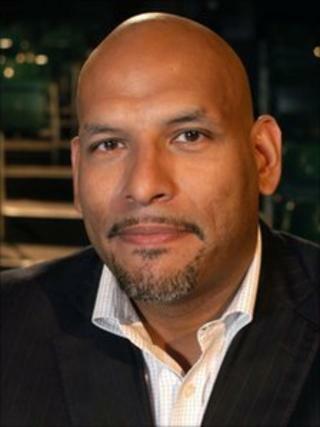 Former basketball star John Amaechi is considering legal action against a bar in Manchester's gay village that refused to let him in. The 39-year-old said a doorman at Crunch on Canal Street described him as "big, black and could be trouble". Mr Amaechi, who was out with friends on Friday, has complained to the council and demanded an apology from the bar. Crunch said entry was refused on safety grounds and called the allegations "outrageous and unfounded". Mr Amaechi's office has written to the club to seek an explanation for why he was refused entry. "I want an explanation of what happened - a real true explanation - and an apology, and they have not in any way been forthcoming with that," he told the BBC. "I think when you go to the village or when you go to any venue in a progressive city like Manchester there shouldn't be a policy on the door that says the way that you look means you shouldn't be able to get into a venue. "I'm going to pursue this through all the channels I have because when there are issues of bigotry we should pursue them very strongly." In a statement, bar manager Matt Taylor said Mr Amaechi was refused entry because staff received a radio message that a group matching his party's description had been "argumentative and aggressive" with another venue's door staff. Mr Amaechi denies that allegation, pointing out that some of his friends - members of the village football team - were allowed entry. Mr Taylor insisted his door staff had "acted correctly". "Whilst I understand it is upsetting to be turned away from a venue when on a night out, to justify a refusal of entry by provoking a racist debate is completely uncalled for," he said. "Following a discussion with the staff that were present at the time, we are satisfied that there was neither racism shown nor bigoted comments made as suggested. "Crunch is a large venue in the gay village employing people of all different groups: white, black, gay, straight and more - we do not discriminate on any grounds. "These allegations are outrageous and completely unfounded." The 6ft 10in tall (2.1m) athlete was born in Boston in the US and raised in Stockport, Greater Manchester, before moving to Ohio as a teenager and getting a basketball scholarship at Penn State University. He went on to spend four years playing in the NBA, the top basketball league in the world, with Orlando Magic, Utah Jazz and Houston Rockets before retiring in 2003. Mr Amaechi came out as gay in 2007 with the publication of his autobiography. He now runs a motivational speaking business from Manchester and founded the Amaechi Basketball Centre at the city's Whalley Range High School for Girls.